Born: 23 March 1865, Worcester, United Kingdom. Died: 3 January 1957, Place not known. 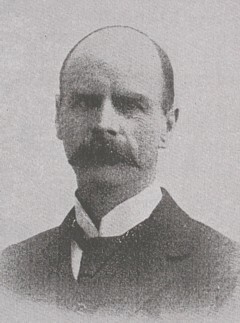 Edward James Lugard, youngest son of Reverend Frederick Greuber Lugard and his wife Mary Jane (born Howard), was involved in farming in Manitoba and Northwest Territories, Canada, during 1883-1884. The next year he joined the 3rd Worcestershire Regiment in England, and in November 1886 was attached to the Northumberland Fusiliers. He was transferred to the Bengal Staff Corps (later the Indian Army) in 1888 and after serving in two military expeditions with the rank of lieutenant was created a companion of the Distinguished Service Order (DSO) in November 1890. In 1893 he married Charlotte Eleanor Howard (1859-1939), a professional painter of miniatures, with whom he had one son. In 1896, with the rank of captain, Lugard was appointed second in command of the British West Charterland Company's expedition across the Kalahari to Ngamiland, led by his brother, Major (later Lord) Frederick John Dealtry Lugard (1858-1945). The two brothers jointly collected plants during this journey. Edward, accompanied by his wife Charlotte Eleanor Lugard, then led a second expedition to the same area during 1897-1899. They both collected plants, while Mrs Lugard also made water-colour paintings of a number of species. During 1898 Edward sent some plants from Ngamiland to the Albany Museum, Grahamstown. The plants collected during both expeditions were described by Edward Lugard and N.E. Brown* in "The flora of Ngamiland" (Kew Bulletin, 1909, pp. 81-146). They found that 92 of the 374 species were new, and named 24 of these after one or other of the Lugards. Among the new species were six Stapeliads, including Caralluma lugardi and Hoodia lugardi. During 1899-1900 Edward served in the Anglo-Boer War (1899-1902) as a special service officer. From 1903 to 1906 he was political assistant to his brother, who was then the high commissioner of northern Nigeria. There he again collected plants. In 1906 he retired from the Indian Army and from 1908 to 1912 was secretary to the Imperial Institute, London (estabished in 1893 to study the economic resources of the British Empire). From 1912 to 1915 he was secretary to the governor of Nigeria. During World War I (1914-1918) he served in the Naval Intelligence Division (1915-1919). He was honoured as an Officer of the Order of the British Empire (OBE) in 1918. Later in life he collected plants in Kenya (1930-1931), and published notes on two species in the Cactus and Succulent Journal of Los Angeles (1938, 1941). Most of his specimens, as well as Mrs Lugard's botanical drawings, are in the herbarium of the Royal Botanical Gardens at Kew, London. Cape of Good Hope. Report of the committee of the Albany Museum, 1898. Maj Edward James Lugard. Geni. Retrieved from https://www.geni.com/people/Maj-Edward-Lugard/6000000026134743505 on 2018-6-18. White, A. & Sloane, B.L. The Stapeliae (2nd ed., Vol. 1, pp. 123-125). Pasadena, 1937.